One of the main features of the Easter Vigil is the rehearsal of the story of salvation through both signs and readings. But this rehearsal is not a simple retelling by candlelight of what God has done for us; rather it is the way in which we make present the defining events that led us to salvation in such a way that these may take hold on our hearts afresh. In tonight’s readings we are told the story from a particular angle. We could recount the deeds of the Lord from different perspectives, for example from that of liberation theology, but tonight we hear them from the angle of renewal and restoration. Through these readings we see that, after God brings forth creation in all its splendour, he does not abandon it, but like a loving Father he renews and restores it every time something seems to go wrong. Likewise, when he chooses to cooperate with humanity in bringing about salvation he does not go back on his word once we turn away from him, but he steadfastly renews his love for us. When Israel, our ancestors in the faith, cries to the Lord from their slavery, God restores their freedom and renews their faith. When the holy people again lose faith, when their love for him becomes lukewarm, and their religion lifeless (as in the case described in our first reading from Ezekiel) God renews them breathing new life in them. When the world appears diseased once more through the corruption of human society God promises renewal and healing flowing like water from the altar of his house. Finally, in the resurrection of Jesus we see the crowning moment of renewal for all creation. But this renewal is not an event locked in the past, it is made present through Baptism and the Eucharist, so that in every age people might ‘walk in newness of life’ (Romans 6:4). 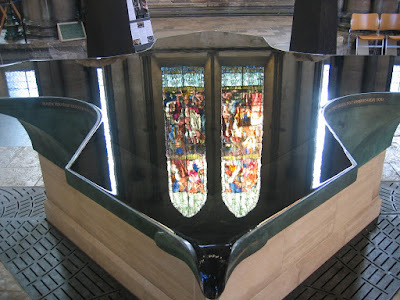 By being immersed in the waters of Baptism we are buried with Jesus in his death and raised to new life in his body; through this sacrament the image of God is restored in our humanity, and the virtues of faith, hope and charity are grafted in our hearts. Then, by encountering the risen Lord in the Eucharist we are constantly renewed, the virtues are nurtured, and our humanity is infused with the glow of eternal life. As we come together to celebrate the glorious night in which God accomplished all this for us, as we make present these events with great wonder and joy, let us renew our commitments to Jesus and to his Church. As we do this we pray that what we celebrate through signs and readings may become a living reality, so that we may cooperate with the Father in furthering his restoration and renewal of creation.